Let’s face it, the best part of last year’s Batman v Superman: Dawn of Justice was the arrival of Wonder Woman (Gal Gadot) during the epic confrontation. 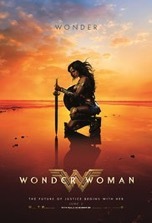 Providing some much needed vitality and panache to a mostly ponderous and lackluster film, Wonder Woman’s presence served the dual function of saving one film and instilling confidence in her ability to carry another. As it turns out, that confidence was well-placed since Wonder Woman is a far better film than that other one where the two squabbling male heroes needed the feminine touch to avert Doomsday. The first film to feature a female superhero opens with an elegant back story that gives us a glimpse into the early years of clay-made Diana (Lilly Aspell), who is raised on a paradise island among Amazon women—governed by Connie Nielsen and Robin Wright. We’re treated to a montage of well-choreographed training scenes, and then, quicker than you can yell “Princess of Themyscira,” Diana (Gadot) has transformed into an adult. Diana’s tranquil, idyllic life is suddenly disrupted by the arrival of a German plane that crashes into the ocean inside the protective dome created by Zeus (isn’t it supposed to be impenetrable?). Diana rescues the pilot, Captain Steve Trevor (not James Kirk), who is played by Chris Pine. Steve, a British spy who speaks with an American accent, is in possession of information that could prove instrumental in ending the war. Diana is also invested in the cessation of hostilities and assigns herself the task of destroying Ares, the god of war. But will their opposing views on how to stop the bloodshed create its own conflict between Diana and Steve? Set during WWI, WW is a curious cross-universe twin of Marvel’s Captain America: The First Avenger (2011), which took place during World War II and also featured a super-strong hero armed with an impervious, circular shield and an unerring moral compass. Was setting WW in 1918 instead of the post-Doomsday present a misstep? Hard to say, but the film’s quality certainly doesn’t suffer from the decision over its milieu. Gadot and Pine have excellent chemistry together and the other performers offer stellar support, especially Danny Huston and David Thewlis. WW contains the optimal balance of story to action…let’s hope the upcoming Justice League follows that same formula. And why no Superman in JL? Wasn’t DC’s long game with Man of Steel (2013) and BVS to have Henry Cavill, along with Ben Affleck and Gadot, headline JL—a strategy filched wholesale from rival Marvel, which set up The Avengers franchise with its raft of stand-alone superhero showcases? Superman’s conspicuous absence from JL not only squanders Cavill’s talents, but also sidelines one of the most recognizable superheroes in the world from anchoring a film that’s been in the planning stages for years. Well, at least Wonder Woman will appear in JL. She’s proven herself to be a solid reliever as well as a dependable starter. WW is the best DC movie since Christopher Nolan’s Batman films. Will wonders never cease?